Set in the heart of North Dorset, in the Dorset Downs and surrounded by beautiful rural countryside, Tarrant Monkton & Launceston is a village which typifies English community life. All Saints Church and The Langton Arms provide the focus to the village centre. Our main tourist attraction is the ancient Pack Horse Bridge over the River Tarrant at the Ford, locally called the Splash. 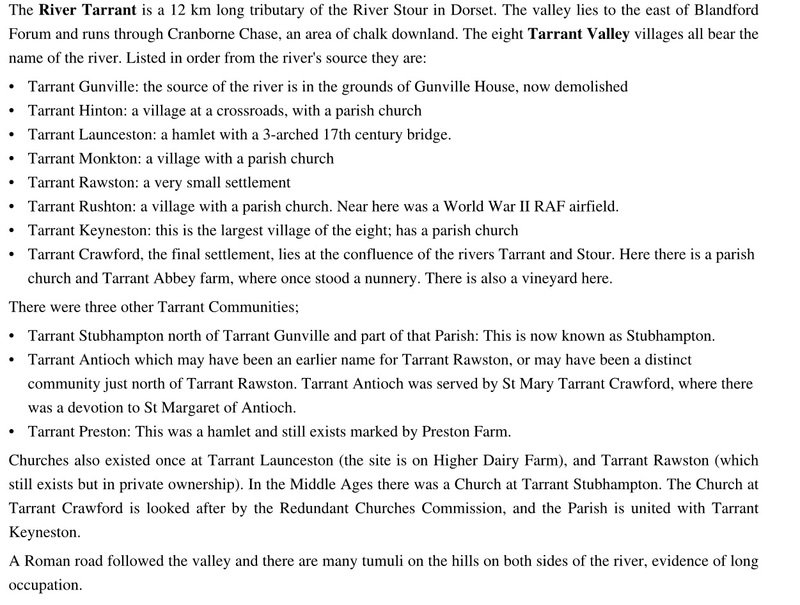 Tarrant Launceston has been linked throughout history to to Tarrant Monkton, sharing the Church, Village Hall and Parish Council. The village is in the southern part of the Cranborne & West Wiltshire Downs AONB and Tarrant Monkton is a Conservation Area with various listed cottages. Tarrant Launceston consists of 31 houses with approx. 80 residents. 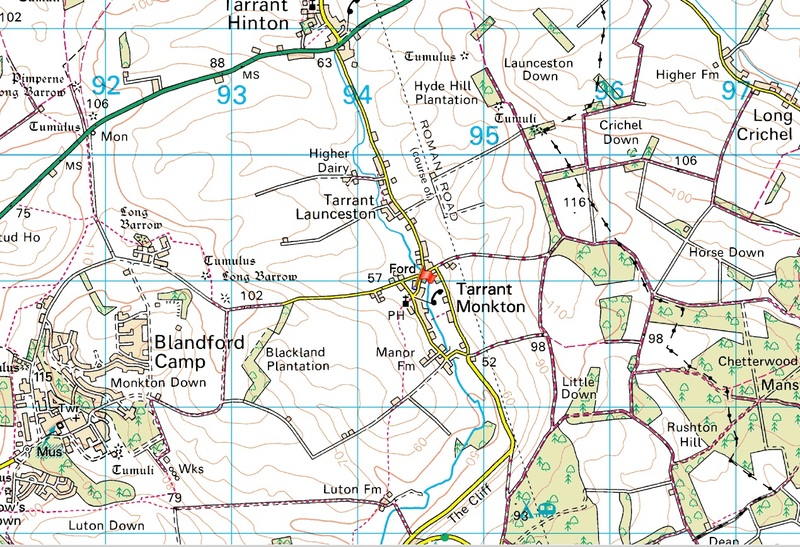 Tarrant Monkton has 58 houses with approx. 120 residents. The two parishes also encompass Blandford Camp which houses The Royal Corps of Signals. Convent at Tarrant Crawford to “amend their diet”. The village was then thought to be named Monachorum Torrento i.e. “the place of the monks by the stream”. ln medieval times there was a church at Tarrant Launceston (near the present dairy of Launceston Farm). After the Reformation it became a Chapel of Ease; served by the Vicar of Tarrant Monkton. lt gradually fell into disuse and was demolished in the 18th century. Pieces of its masonry can still be seen locally. Tarrant Launceston was sometimes called Lanston by the Census in the 19th century. Tarrant Monkton was owned at Domesday by the Abbey of Cranborne and was later annexed to the larger Abbey of Tewkesbury ” for the improvement of the table of the monks.” It thus gained the name ” Tarent Monachorum.” After tbe Dissolution Queen Elizabeth granted it to Henry Uvedale, who in 1579 sold it to Thomas and Richard Hannam. By the eighteenth century it had passed to George Doddington, and was purchased from his heirs by Mr. J.J.Farquharson. Tarrant Launceston formed part of the endowment of the Benedictine nunnery of the Holy Trinity, which Maud, wife of the Conqueror, founded at Caen in Normandy. It was seized by Edward III at the outbreak of war with France, and after a variety of ownerships was claimed by Henry Uvedale of Tarrant Monkton, who sold it with that property. At the time of its purchase by Mr. J.J.Farquharson it was the property of the Marquis of Buckingham.